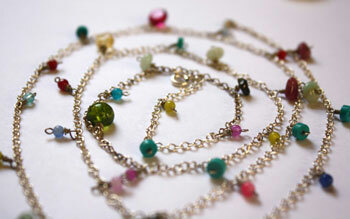 The tourmaline can be found in a wide variety of colors. They all have a different name. However, the last trend is to name them as tourmaline plus adding its color (click here to see the general characteristics of the tourmaline). In the case of the green tourmaline, the most common variety is verdelite that owes its name to its large variety of color. It is quite rare to see other green tourmalines than this one but you will be able to find for example the chromifere. It is a rare stone and people are often looking for this variety. The verdelite can go from yellow green colors to very dark green hues. You can also find dark green or olive green stones. Its color can also be identical to the one of the emerald and can easily replace it. Indeed, this similarity provoked various rushes to excavate this stone. It was the case for Brazil when a Spanish conquistador saw one for the first time. We cannot know exactly how many were brought back to Europe thinking that they were emeralds. However, recently, many famous pieces of jewels wearing "emeralds" were identified as being green tourmaline. Mines: Brazil, Afghanistan, Pakistan, the USA, Sri Lanka, Russia, Angola, Australia, Burma, India, Italia and Tanzania. It would be efficient against blood poisoning, anemia and infectious diseases. The green tourmaline would efficient against tiredness. It would clean the blood system from anything that would prevent a good circulation. The green tourmaline would be efficient with eye problems. It would help regenerating liver and glands in general. The green tourmaline would be the stone of the garden. It would help plants growing and would increase the effect of medicinal plants. It is often said to be the stone of herbalists. It has the same properties than tourmaline in general.